"DOGGIE DUDE RANCH of CNY, INC."
2019 - Celebrating 10 Years! A "FIRST RATE" DOG BOARDING, DOG KENNEL and DOGGIE DAYCARE facility nestled in a quiet country setting of Pulaski NY. Your dog will NOT spend all day in his/her kennel. LOTS of play time here at the ranch!! We are located in upstate New York just minutes off Interstate I-81; 30 minutes south of Watertown and 30 minutes north of Syracuse. 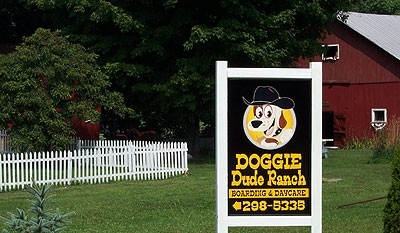 DOGGIE DUDE RANCH of CNY, INC. The kennel can be reached between the hours of 9am to 5pm Monday thru Saturday.